Meet John McBride today in Murphy’s Heist. Want to meet John? David Chilcott, author of John’s first adventure in Murphy’s Heist, has kindly set aside a little time to introduce us all to him and share a little taste of his life as an author. David, let’s wind back the clock a little to John’s origin story. What inspired you to write this first book, that has continued for another six books? In the nineties, after the troubles, I happened to be in Belfast, waiting for a ferry to England. I was wanting a meal, and the gatekeeper recommended a bar just outside the dock. When I walked across the road, I saw it was a smart modern bar in the run down area. There were no other customers and I got talking to the barman. He told me the bar had been blown up because the owner stopped paying protection money. Wow, I can see how that inspired some interesting questions and stories! After this introduction to this world, did you feel it was important to inject a few tales from your own life to draw a little more life into the tale? I think every author must include some background of his own life. For instance, I was for many years a professional watercolour artist. That is why John McBride is an artist. He can get involved in adventures. He couldn’t do that if he was a nine to five man in an office. So, tell us a little more about John and the cast of characters he meets. Who does he meet outside of the world of offices? Thinking how as schoolchildren we cement friendships: Thus Murphy was the tearaway child of a single mother, one of his friends had parents who went to live in England, and so the lad became a policeman when he was an adult. And his other friend became an estate agent, and then a developer. He helped Murphy fence the goods. An interesting cast to tell an interesting story. And what did you feel these characters were nudging you to share in this tale? The people who did it were criminals posing as new IRA. On the ferry going home, I wondered what these criminals were doing. I thought that some of them might be in England, where the pickings might be easier. That was the germ of the book. Since John is still adventuring six books later we know that the two of you really connected. But did you ever find writing these tales exhausting? Writing energises me, and I can write several thousand words a day, but I also can leave the book alone for a week at a time. But during these times I am thinking what happens next! I don’t plot out the book first, but start writing after having a broad outline, which the book might alter in writing! So, what’s on your mind as you’re turning these events into a story? I feel as though I am watching as a film director. Oh, that’s neat. Do you feel that your voice as a director and writer has changed from the first book to the seventh? I always write in third person. First person is too restricting. That’s a good lesson to have learnt. What else have you learnt along the way while writing John’s stories? Tremendous. It was my first book, I had it edited, and the editor suggested parts of it should be re-written. She was right! And John and his adventures were all the better for the change! So, what adventure are you working on right now? My seventh book in the John McBride series. We’ve talked so much about John today, I’m sure there are now people who can’t wait to read all seven books. How can they meet John quickly? My website contains John McBride’s autobiography, which gives a few insights! I’ll have to check it out. David thanks so much for introducing us to John and his fellow adventurers in today, and I can’t wait to hear about the next instalment. Excited to read the book we discussed today? Find it here on Amazon: ‘Murphy’s Heist ( ASIN: B00PC5NWVX0 )‘. 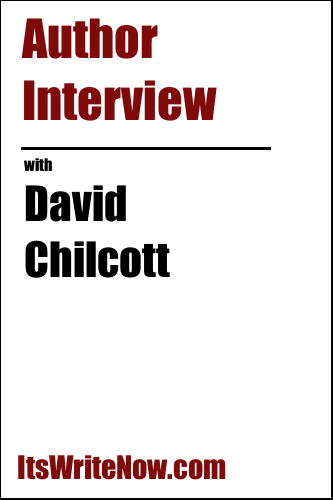 Want to find out more about David Chilcott? Connect here!